Life is filled with so much pain from sickness, suffering, and disappointments. While there are many blessings as well, no one can deny the heaviness many experience through seasons of suffering. When you hear of a mother battling cancer while trying to care for her children, a child fighting for his life against leukemia, the mass amounts of people struggling with debilitating auto-immune diseases or just the many disappointments that often seem to come all at the same time; how do we not just survive but experience contentment and peace a midst all the pain? For example, when I get a phone call from my husband telling me that he won’t be home till late because he’s on call for work, I am immediately faced with a battle. While I desire to respond graciously knowing how much he’d rather be home, many ongoing physical problems make me feel like crawling into bed, rather than facing the reality of another night alone dealing with circumstances that feel impossible to handle. Many times each day I plead with the Lord to give me the strength to just keep going. When everything in me wants to quit and check out, I am learning what it means to need the strength of the Holy Spirit to just make it to the end of the day. By God’s grace, I have surrendered my life to Jesus Christ. I desire to obey Him and follow where He leads me. But in all honesty, constant physical ailments and pain have tested my faith more than any other circumstance in life. If I feel strong physically then I feel much more capable to handle the other storms of life. However, God has allowed every area of my life to be taken to a breaking point and my body has been wearing away under the weight of it all. Anyone who suffers with chronic pain understands how quickly it brings you to the end of yourself. How do we handle the many hardships of life when our bodies fail us? I know God can bring healing in an instant, but what if He has chosen not to? There are 5 truths God has been teaching me through these verses. 3. Sometimes God chooses to allow the thorn in our flesh in order to reveal our weaknesses and need for complete dependency on Christ. “My grace is sufficient for you, for my power is made perfect in weakness.” v.9 In our flesh, our tendency is to fall back on our own sufficiency and strength. So it’s God’s grace when he allows things in our lives that make us depend on him more and learn that He is all that we need. When we can’t rely on ourselves, we are driven to rely more on Him. 4. When we recognize, acknowledge, and even boast in our weaknesses, that is when the power of Christ will rest upon us in a heart-changing and God-glorifying way. Over the last few years, my prayers for answers and relief have gradually changed into prayers of desperation for Christ to carry me through in His strength and not let me go. He has been changing my heart through the pain. “Therefore I will boast all the more gladly of my weaknesses, so that the power of Christ may rest upon me.” v.9b Seeing the power of Christ rest upon us will increase our faith and help us see purpose in our pain. It reveals His glory to us and those around us. 5. 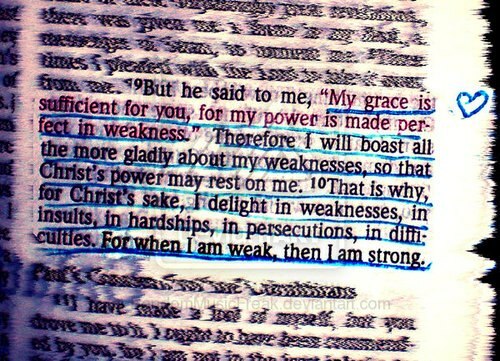 Contentment and joy come with acceptance of our weaknesses and boasting in Christ’s strength instead of our own. Sometimes God’s answer is in the form of healing and relief, but other times His answer is “My grace is sufficient for you, and my power is made perfect in weakness.” Paul pleaded with the Lord three times until God answered. Once God answered, he didn’t keep pleading and arguing with the Lord because He didn’t like the answer. He instead accepted God’s answer and chose to obediently follow His eternal purposes for the thorn in his flesh. I have struggled with finding joy as I endure the trials in my life and I yearn for heaven a little more each day. But what I’m learning as I read through Paul’s response, is that we will not find joy until we accept what God is allowing in our lives and see greater value in becoming more like Christ than in our circumstances changing. As I continue to pray, asking for relief and answers, I am also daily learning to stop striving in my own strength and grow in understanding of what it means to “boast all the more gladly of my weaknesses, so that the power of Christ may rest upon me.” God has allowed everything in my life for a reason, and while I may not understand a lot of it, I do have His promises that He will equip me for everything that He calls me to. So let us stop striving with fear and anxiousness to change what we don’t have the power to change and, cry out to the Lord in our weakness that He would be our strength. Every breath we take is dependent on His sustaining power. Let’s pray that Jesus will increase our faith so that we desire more of Him than anything else in this world, even if it means His answer to us in times of pain is not a solution to our problems but a faithful promise that His power will be made perfect in our weakness. May we experience a greater joy and satisfaction in Him than we ever would without the weaknesses He has allowed in our lives. Previous postMy Life is Not What I Expected…Praise God! A good reminder. Thanks Sarah. I’ve only met you a few times at church-but this is just what I needed to hear today!Thanks for sharing your heart! I too have found myself many days struggling with physical issues of my own while taking care of 3 small children. I know exactly what it’s like to be praying for Gods’ strength just to make it to the end of the day so this was a great encouragement to me to stop trying to do things in my own strength & depend on the Lord. Cindy, I love seeing how God uses His truth through our lives to speak to us at just the right time. I will be praying for you as you learn to rely on Christ’s strength as I am do the same. Thank you for taking the time to share with me! Great reminder for me of how to best see clearly is through the lens of scripture. The depth of your spiritual maturity grows deeper with each painful step. Nothing is being wasted in the journey God has you, and your family on. I pray your growing faith in the midst of real trials will be an encouragement and guide to others facing their own life struggles. Love you, Dad. Thank you, Dad. I love you so much and am so thankful for your unbelievable support! This is wonderful. May the name of God be praised.